GaDGeTS is a collection of Animation Components which you can Drag&Drop in Adobe Flash .fla files from the Component Panel onto the timeline or stage. They offer a wide range of customization options and features. 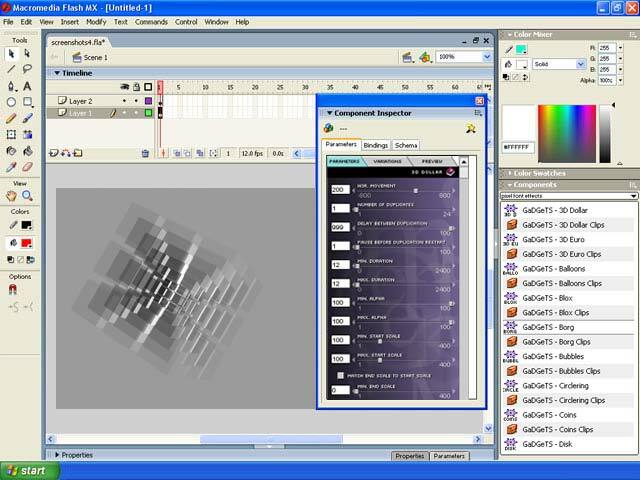 GaDGeTS AS3 Components, animation plugins used directly in Adobe Flash CS3 .fla files GaDGeTS Components contain over over 90 predefined effect variations. All animation visual contents can be edited by openening their Library itmes. ...... fla files GaDGeTS Components contain over over 90 predefined effect variations. * GaDGeTS Components can be used by users of any skill-level, allowing simple drag&drop to stage. * All effects contain a list of predefined variations and offer a quick preview to see settings and avoid having to play long .fla timelines to see the result. Qweas is providing links to GaDGeTS AS3, Flash Animation Components 1.1.0 as a courtesy, and makes no representations regarding GaDGeTS AS3, Flash Animation Components or any other applications or any information related thereto. Any questions, complaints or claims regarding this application GaDGeTS AS3, Flash Animation Components 1.1.0 must be directed to the appropriate software vendor. You may click the publisher link of GaDGeTS AS3, Flash Animation Components on the top of this page to get more details about the vendor.